RooWifi is a development board to communicate with Roomba robots using Wi-Fi connectivity and helps software developers to learn an improve their programming skills with robot interaction. RooWifi is the device / non-official plugin that lets you control your iRobot Roomba remotely and wireless from your application. The Wi-Fi Remote for Roomba is the Wi-Fi Adapter that you need to integrate to your home automation/domotics system. Remember that we are not affiliated with iRobot Corporation and the use of this product may void the warranty of Roomba. iRobot compatible models with Roomba Wi-Fi Remote? 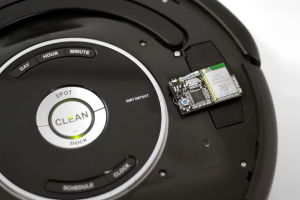 RooWifi: Roomba Wi-Fi Remote is compatible with any iRobot Roomba cleaning robot. It is very easy, take a look to this list of compatible models to be sure: Roomba Compatible Models. As example, you could see this link and find multimedia showing and example of using this wireless module with a 7xx and 5xx series models. RooWifi: The Wifi Adapter for Roomba is compatible with the major part of Home Automation Systems in the market as you can see in this website (Home Automation Systems List). If you have a custom Home Automation System you can take a look to our API. Is my Smartphone, Tablet or PC compatible? Nowadays RooWifi Roomba Adapter is able to be managed from any PC with Windows, Linux, MacOS, any device with iOS (iPad/iPhone/iPod) or with Android in root mode at first run when plugged to your Roomba. Once you configured the Home Wifi Network you can use any device with LAN access and web browser. In any case, we have already developed this App for iPhone and this App for Android (thanks to Paco Salazar) and if you are a developer we have this API for developments in any Desktop OS as Linux, MacOS or Windows. How can I communicate with my robot? At last option: If you prefer you can connect through AJAXRequests to emulate the iRobot Roomba button and JSON or XML for the sensors and manage the robot from a website. You must see this. Note: Roomba robot is sold separately and is not included in the product offer. We are not affiliated with iRobot Corporation.